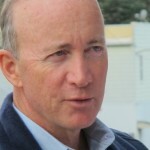 Mitch Daniels will be Purdue University's next president. Trustees presented him with a Purdue motorcycle jacket as a welcome gift. Gov. 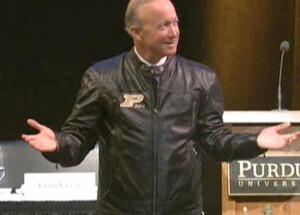 Mitch Daniels will be the next president of Purdue University, the Board of Trustees announced Thursday in West Lafayette. “Purdue University has deeply honored me. I will endeavor to honor Purdue,” the governor said on the stage of the Loeb Playhouse on campus. Daniels also promised to immediately recuse himself from “all partisan activity or commentary,” a sign the man who was once mentioned as a GOP presidential candidate will likely not be stumping for Mitt Romney or Indiana gubernatorial candidate Mike Pence. Tim Sands, Purdue’s provost, will serve as the school’s interim president until Daniels’ term as governor expires in January 2013. Reports began circling Tuesday the governor would be headed to Purdue. StateImpact and Indiana Public Media confirmed the rumors with a source close to the governor. Daniels refused to discuss the matter at a business meeting in Indianapolis Wednesday ahead of the official announcement. Earlier this spring, he declined to comment when asked if he might be in the running for Purdue’s top job. Daniels appointed eight of the ten Purdue trustees who voted on his nomination, leading some to say it would be inappropriate for him to accept the job. An online petition points to the state’s “cooling off” rule that bars executive branch employees from seeking employment with organizations that do business with the state. The governor’s track record on higher education worries some. Daniels has told Indiana’s public universities to live within their means and tied funding to degree completion. He’s said Indiana students need more career and technical training and advocated for alternatives to four-year universities, appearing in commercials for the online Western Governors University. But the move from governor to university president isn’t that unusual. Daniels certainly isn’t the first to jump from politics to academia. Purdue’s outgoing president, France Córdova, is an astrophysicist. Daniels holds a bachelor’s degree from Princeton and a law degree from Georgetown. Reporter Kyle Stokes posted updates from Bloomington. This post will continue to be updated as reaction pours in.